I just like it plain and simple with pepperoni and pineapple. A bit of sweet and a bit of heat. Yum. Ooh, nice choice with the pepperoni., Patricia. Nothing like a bit of spice to excite your tastebuds. Thanks for joining in. Good luck in the draw! Hi Fiona, I love to read all books of Australian Outback, keep up the great work. My favourite Pizza’s are homemade with plenty of vegies sliced thinly, ham or bacon, cheese and a couple of eggs cracked on the top. It s a great way to get kids to each vegies with out knowing it! I always make my own base using a scone mix. Well, Fiona, I’m super jealous of your trip to Italy which I’m pretty sure I’ve mentioned many times on your facebook page while you were there! I LOVE margharita pizza however my husband believed (up until a week ago) that it didn’t deserve the title of a pizza. He just got back from a business trip to Italy as well & has since realised that it is actually the true definition of Pizza – I’m hoping that means I can start ordering them!!! I also agree that I used to enjoy pineapple on my pizza but now, I can’t stand it!! Thanks for a great read on a miserable Melbourne Friday morning!! I think we’re all super jealous, Melissa! Wasn’t it fun to follow Fiona’s travels on Facebook? How funny about your husband. Hopefully he has now seen the light and you’ll get your Margheritas! Funnily enough, Catherine, I had a margarita pizza the other night, it was delicious and helped my sudden craving after reading about Fiona’s travels! We had one last night too, Melissa. Buonissimo! Hi Melissa. My kids don’t like pineapple so we never have it on ours. Which I don’t mind. Plenty of other yumo stuff to use. You could always catch a quick flight across, Paula. Spend a weekend in Florence or Venice or the home of pizza, Naples! Interesting about the chorizo. I bet the oil from it adds great flavour. And yes, feeding the mind and belly, that’s Friday Feast!! Oh Paula mushrooms are the best. It was the right time when we were there and they had fresh mushrooms for everything. Loved it. I love the pizza at a local restaurant Leura Garage (where Ms Hein and I have sample their wares). Chorizo, another type of salami and some smoked ham from Trunkey Creek smokehouse in Orange. Yummo! Plus a glass of rose (accent on the e) to go with it. Great for a lazy lunch. I feel another sample of this restaurant is in order, Keziah. There is much I haven’t sampled on the menu! Definitely going to check out the smokehouse. Another thing to add to my post-edits list. Ah, Italy. 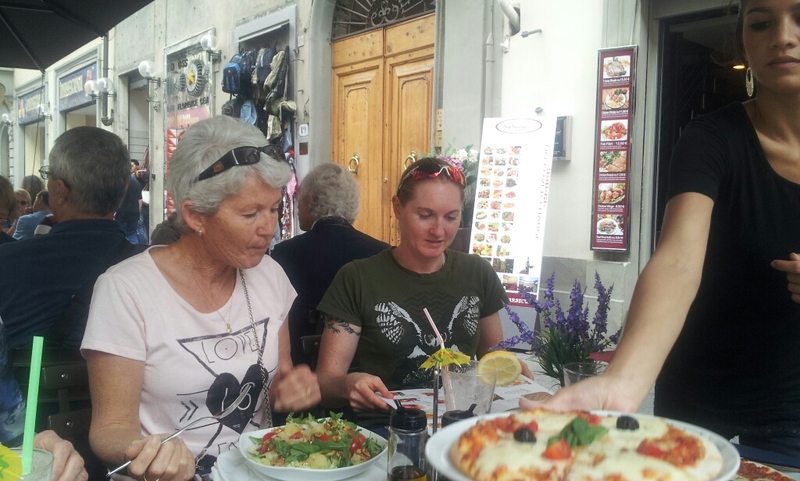 We’ll be back there next year and first lunch or dinner will definitely be a Margherita pizza at a local trattoria while we watch the passing parade. You’re so right about the taste of the tomatoes there, Fiona. Another great post, Cathryn and Fiona, thanks. Another one going travelling. Aargh! Why can’t it be me????? It’s interesting, isn’t it, Christine, the difference in the taste of the produce. I noticed it in France, too, with a lot of the veg. Never had capsicums so sweet! I don’t know if it’s the soil or variety or what. I’m jealous Christine. Wish I could go back but it might be years before my next trip. 🙁 I’d love to take hubby back and show him everything! Fiona and Cathryn, thanks for another great Friday Feast. 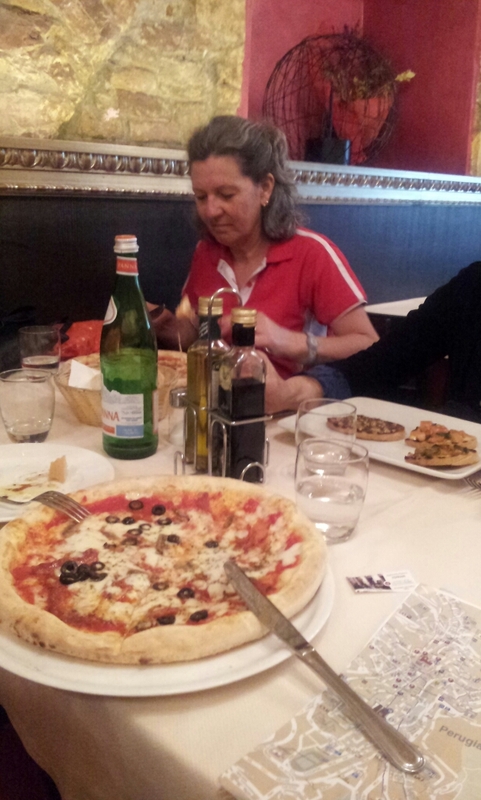 I was in Italy in May and loved, loved, loved the pizza. The Margherita is classic but I also like mushrooms on my pizza. And non-marinated artichokes. Those were a revelation. After Italy I’m a convert to minimalist toppings, whatever they may be. I am just about sobbing with travel envy here!! Yup, I’m with you, Joan. Less is better when it comes to pizza. Thanks Joan. I loved the thin tasty bases too. Ah yum. I am a fan of many toppings, but if I’m getting a single topping pizza its onion. I know that may sound a little boring, but when some of them caramelize a bit while other’s still have some bite. YUM. We don’t mind a little bit of onion either, JM, but try thinly sliced French shallots. They turn really sweet and tasty. Love ’em. You had me at Italian! 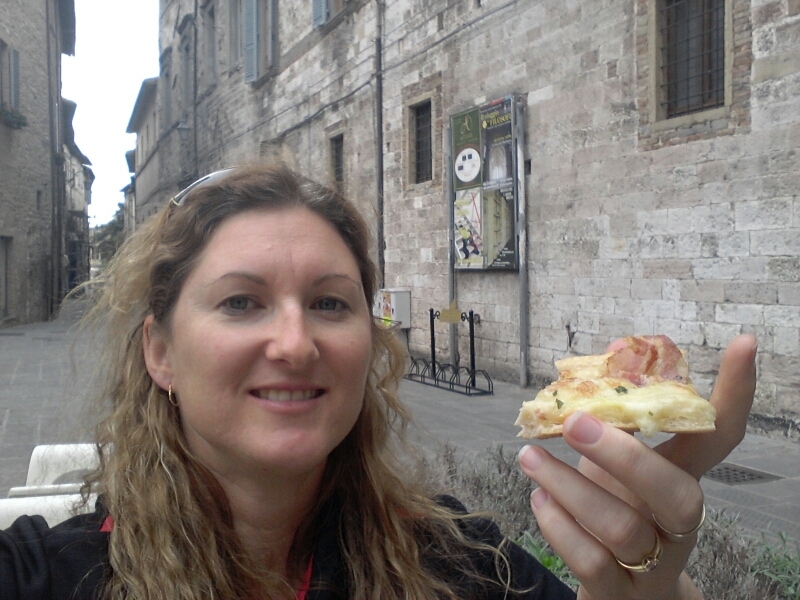 What else would a true blue, Holden-lovin’ country girl eat other than pizza? Now I have another book to add to my Fiona Palmer library. Look out BIg W, here I come! I’m blessed in so many ways: a) I have a hubby who cooks and b) we have a wood-fired pizza oven on our alfresco. In a family of Meatlovers, I have no choice but to add my own veggies. My favourite is pumpkin and feta with a light touch of basil and garlic. Yummo! You have a wood-fired pizza oven, Juanita? Like I don’t have enough to cry with jealousy over!! 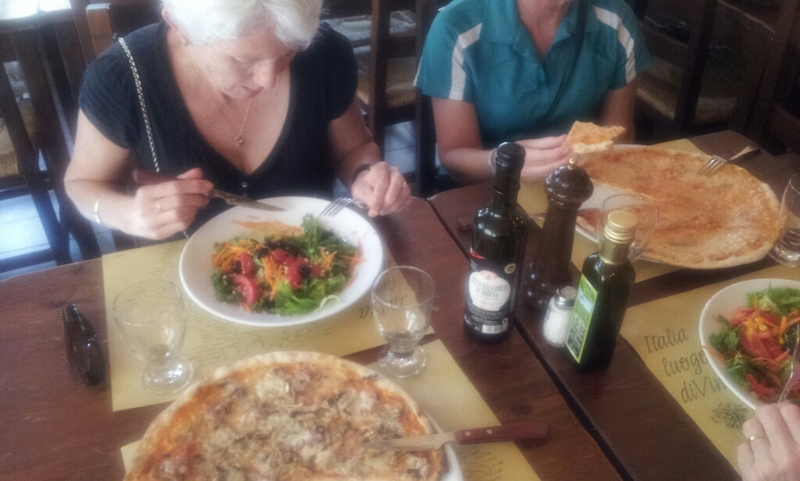 Great post – very envious of all that wonderful Pizza eating. Having said that, our local pizzacheria won Australia’s best pizza award recently. Then promptly had its front windows shot out by a rival pizza maker. They do take these things rather seriously! Anyhow, they absolutely refuse to put pineapple on their pizza. My fave is tomato sauce base, mushroom, anchovy (and lots of it), fior de latte, basil. Ultra thin crust. Delicious. And probably shouldn’t say this but he has some pizza makers out from Italy on 457 visas! Ha ha ha ha!!! Oh yes, they take their pizza veeeeery seriously down Melbourne way! Love that story, Louise. Sooo with you on the ultra thin crust. That’s a must. It has to be pesto – lots of basil, a hint of chilli to spice it up and toasted pine nuts. When I really want to go all out I layer with a little thinly sliced tomato, olives and crumbled fetta. My mouth is now watering on the train and I have an urge to run away to Italy!